Hello there Leo Listeners. 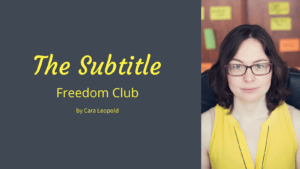 It’s Cara here from Leo Listening, where I help advanced English learners fall back in love with their favourite films and TV series by helping them to break free from the subtitles. To finish off this month on personal development as it applies to listening, I’m going to work on the speech of one of the most famous speakers on personal development out there – Brené Brown. She’s famous for her books and talks all about vulnerability, courage and imperfection. I’m going to compare how she speaks in a TED talk with how she speaks when she’s in natural, spontaneous conversation. This is to really show you the difference between the two, because I’m really sick of people telling people like you, who are learning English, “Just watch a TED talk”. Or “Just watch a TED talk because there’s an interactive transcript”. This is reducing listening, learning, and understanding to tools, and not to what you actually need. I would only recommend TED talks if you really need to understand that kind of academic monologue because you have to understand speeches, or because you have to understand presentations at work, or because you have to do public speaking yourself. That’s when you should use TED talks. Or if you’re just interested in the topic, you can use TED talks. Or you can use my tips to spice up the TED talks to make them a bit more difficult, and closer to spontaneous natural speech. Ultimately, what you should listen to depends on what your goals are. If you want to understand native speakers when they’re talking fast, then you need to listen to resources where you have native speakers talking fast. If you want to be able to understand a particular series, you need to watch that series. Don’t waste your time watching TED talks if they’re not relevant. I really want to emphasise that point today by showing you how Brené’s speech changes from the TED talk to when she’s interacting spontaneously in an interview. That’s what I’m walking you through today. We’ll start off with her TED talk on listening to shame. In the first minute of this TED talk, which is what we’re going to work on, she actually talks about a previous TED talk that she did, “The power of vulnerability”. So she talks about what happened after she gave that talk. We’re going to listen to some sections and I’m going to walk you through what’s happening, and the features of academic monologues like TED talks. Interestingly, when she first starts this talk, at about 18 seconds in, she says “I’m going to”, but in a really fast, squashed-down way. It sounds like “am’a”. So that’s more conversational. This doesn’t shock me because Brené Brown is someone who often talks in quite a conversational, informal way. So that’s fair enough. Afterwards though, in these first few seconds, she’s using a lot of deliberate pauses for effect. This is what people do when they’re giving this kind of monologues or speeches. So she’s using these pauses for effect. We can tell that she’s prepared the speech. She’s not using any of the disfluency features that we hear in English. These are not pauses to help her think about what she’s going to say next. These are pauses for dramatic effect, so that the audience understands and retains the message. Now, even though she’s speaking at a talk, and it’s a bit more formal with this monologue style, it doesn’t mean that some sounds don’t disappear or don’t link. For instance when she says “That talk”, the T at the end of that disappears. “…For about three days”. So we’ve got linking here – for’about. We’ve also got some two-word combinations with “and”. For example “and I” becomes “an’I”. “an’I actually”, which is quite conversational. This section is a little different as well because she’s remembering a conversation that she had with a friend. So she’s kind of adding in the conversational features. She remembers that she repeated herself “I’m I’m”. Normally in a talk, you wouldn’t repeat yourself, but she’s remembering how she spoke in the conversation with the friend when she was feeling vulnerable. Then she goes back into the academic monologue style. She’s speaking much more slowly here. She’s making a huge pause. So we had another huge pause here between the two sections, and again the slow, careful delivery. Ok so there again we have got linking, as we normally do “thad’I had’a breakdown”. She does link that together. But you can see that she is generally speaking a lot more slowly, a lot more carefully, with big pauses between the sections. Again, not because she doesn’t know what she’s going to say, but because she’s prepared it and planned it really carefully to make maximum impact on the audience so that they retain the message. That is typical of a TED talk. Even though, like I say, we still have the connected features in there. That’s why you’re going to find a TED talk much easier to understand than spontaneous speech between two natives. 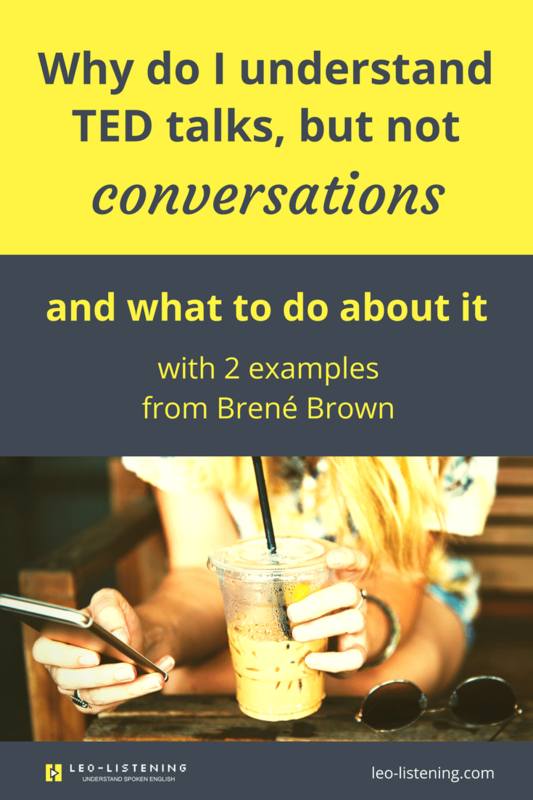 Speaking of that, we’re going to go over to our next video with Brené Brown, which is fairly different to the TED talk. It’s an interview with Marie Forleo, a famous online business guru, who interviews lots of famous people. Obviously this is completely different. For a start, it’s not a monologue. It’s an interaction between two people who know each other well and we’re going to see that’s the case in the way they interact with each other. So it starts off with them shrieking and kissing. So they’re telling each other that they love each other. It’s obviously pretty different to the formal, academic style in a TED talk. It’s a real interaction between two friends. Now I don’t know what Buc-ee’s is. We’re going to discover it. She reduces her question “did you” down to “d’ja” So really informal, conversational pronunciation. So based on what Marie said before about coming to Texas, we can assume that Buc-ee’s is something particular to Texas. So Buc-ee’s is a gigantic gas station that you find in the state of Texas in the US. “And I heard about Buc-ee’s and I go into Buc-ee’s and I was like ‘this is a wonderland!’ O goodness! So Brené is agreeing and supporting Marie in what she’s saying, giving more examples of what you can get in Buc-ee’s. At two minutes 14 she used the expression “you got’it”. That’s a really informal expression that we would use in conversation to show agreement. It’s very American. Definitely not what she would say in a TED talk. “…I was waiting to see if it goes public…. So what she means is they’re waiting to see if Buc-ee’s becomes public, or goes on the stock market so that they can buy shares in the company because they think it’s such an amazing gas station. So there’s a lot going on here. There’s a lot of linking, shrinking, “my husban’an’I” all joins together. “r’always” the “are” is reduced right down to the R sound. “Alwayswai’in” joins together (always waiting). “To see’f’it” also joins together (see if it). Also in this section she doesn’t complete her sentence. She says “I’m like the day, we’re buying in”. Here by “the day” she means “the day it goes public”. She doesn’t need to speak in full sentences here because she’s just interacting normally with a friend. We know from what she said that she would like to buy shares if ever Buc-ee’s goes public. In a TED talk you’d have to be a lot more explicit about what you mean. You can’t rely on shared information between two friends as you would in conversation. You can’t give an incomplete sentence in a TED talk. Nobody will understand what you mean. It’s an incomplete sentence, but we understand what she means because we are watching two people interacting and we’ve seen the shared context. 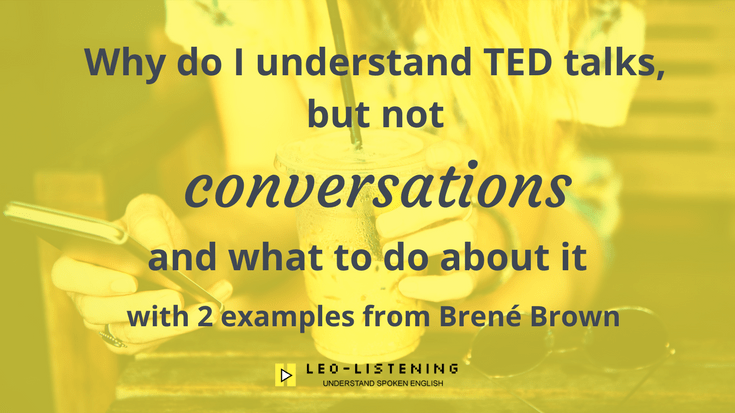 If you watch the whole interview, you might notice that there are some sections where Brené talks more like she does in her TED talks. This is because in the interview, she’s talking about her new book, Brave the Wilderness, and I think that she’s had lots of interviews about this book. She’s prepared for the questions she’s going to get, and she’s prepared the answers she’s going to give. “…we can talk about with each other. So Braving is the acronym we use. B is boundaries. You set boundaries. When you don’t know what they are, you ask. You’re clear about what’s ok and what’s not ok, which is as you know, so hard for people. Boundaries are really hard. So here we can tell that she’s planned what she’s going to say. She’s explaining her acronym braving, and she knows what each letter corresponds to because she invented that idea. She’s still speaking fairly quickly, but a bit more carefully and it’s not as spontaneous as before. She’s not repeating herself or using filler expressions like “you know”. There are even some pauses, which I think are a bit more calculated. So you will notice in this interview that she switches from the very informal conversational style when she’s just chatting with Marie about Texas or things like that, or things they have in common. Then when she switches to really focussing on talking about the book where she is going to sound more like she does in a TED talk. So actually, that is a really interesting thing that you can do. 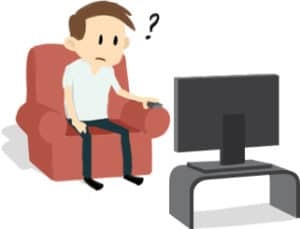 You can watch a TED speaker, and then you can go and have a look around on Google or Youtube to find interviews with that same speaker and notice how they sound when they’re speaking more informally or spontaneously in an interview compared to their TED talk. You can then note down what you notice, but the main things are going to be in a TED talk they’re using pauses for effect. 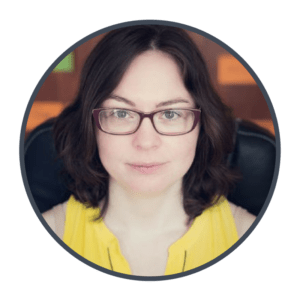 They’ll have planned everything they’re going to say, so you’re not going to hear any disfluency features like repetitions, filler phrases, pauses to reflect on what to say as opposed to pauses for impact, like in the speech. Then of course in more spontaneous interactions, you’re going to hear all of these things. Of course the delivery and the speed of the speech is going to be a lot quicker. If that’s what you struggle with, as most people do, you’re better off listening to resources where you hear people speaking spontaneously. So things like podcasts, TV series to a certain extent, but certainly podcasts, interviews, or any other kind of spontaneous speech that you can get hold of. Youtube is a great resource for that. Thanks for reading and I’ll be back again soon. Relevance, which has been mentioned in this article is the key. I also heard lots about advantages of watching TED Talks. Extremely useful analyse. This is what I was looking for.